Everyone is talking about the Gasparilla Music Festival – and rightfully so. It is an awesome, all day celebration of sound featuring dozens of local and national talent. But it’s not all about the music at Gasparilla. “Raising the Bar” is a reality series put together by Tennessee whisky brand, George Dickel and television producer Thom Beers – the man responsible for “Deadlist Catch” and “Ice Road Truckers.” The series, filmed in Kansas City during the World Series of BBQ, follows six teams of world class craftsman as they attempt to construct unique, top notch bars by hand in only eight hours. At the Gasparilla Music Festival, the George Dickel team along with craftsman Jimmy Diresta will be doing a live, bar build (from scratch) throughout the show. Visit them under the Whiskey Tent to witness some of the live action and get a taste of classic, custom Dickel cocktails and try the new George Dickel Rye. “Raising the Bar” features bars built from metal, classic convertible cars, robotics, and washing machines, so it will be exciting to see what the onsite, live builders will come up with. Tweet at the live team (#GeorgeDickel #RaisingtheBar) throughout the day to let them know how they are doing. 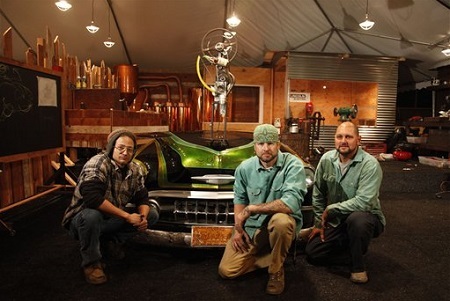 To see what the craftsmen were able to build on the show, check out “Raising the Bar” on Hulu. The first episode premiered on March 4 and featured a bar with a robotic arm that poured George Dickel drinks. It is available now on Hulu. “Both brands pursue the same goals and standards of excellence in our respected crafts,” said Beers, Original Productions (OP) Chairman. “Like Original Productions, George Dickel is a unique American brand with a team dedicated to developing a hand-crafted and distinctive product. The parallels are remarkable.”. For more information about George Dickel Tennessee Whisky and “Raising the Bar,” please visit the Facebook page at Facebook.com/GeorgeDickel. For more informaiton about the Gasparilla Music Festival, please visit www.gasparillamusicfestival.com.